Milton Friedman is one of the most famous economists in history. His writings and theories on everything from capitalism and freedom to deregulation and welfare have inspired movements, influenced government policies, and changed the course of America's economic history. 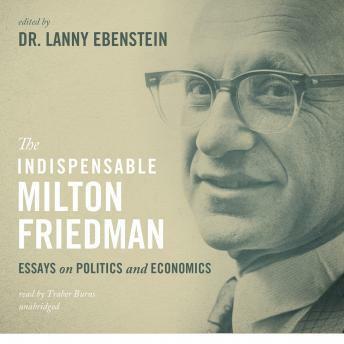 Now, acclaimed Friedman biographer Lanny Ebenstein brings together twenty of Friedman's greatest essays in The Indispensable Milton Friedman: Essays on Politics and Economics. The only collection of Friedman's writings to span his entire career, this book features some of Friedman's never-before-republished writings as well as the best and most timeless of his works. These exceptional essays not only illuminate the progression of Friedman's thought but explain how America might overcome some of its most difficult challenges. During this time of economic uncertainty, The Indispensable Milton Friedman is more necessary than ever.